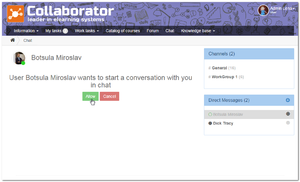 Collaborator v. 1.21.0 – Chat in elearning portal, group and personal communications channels  | Blog of Learning Management System "Collaborator"
Chat – group and personal channels of communication. Reports. Show statistics by tasks participants. Tasks list. Number of unchecked answers in tests task. Resources. Allow to download original documents, that was converted in HTML-pages. Polls. Who voted for that? Polls 360°. Managers have access to reports of competency assessment his employees. solved more than 70 tasks of development, optimization and improvement. 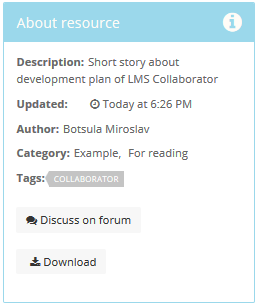 Those who already know Collaborator, discussion about educational resources in the Forum is commonplace. This is live communication. Messages appear in the moment when they are sent, and the discussion runs in real time. Therefore, you can get answers almost immediately. Forum need for group discussion about one particular theme or about global issue. Discussion will be able to see any users for propose their opinions and their solution. The discussion takes place in a calm pace. Nobody expects from topics participants an instant answers and they have time to prepare it. The forum topic always can be found by context searching of Knowledge Base and continue this discuss.. It is impractical for every small question to create a separate forum topic. On simple question may be one concrete answer that solves everything and does not require long discussions. The forum isn’t usable for personal correspondence. But for solutions to operational issues or to advise students, simple quick dialogue is important. 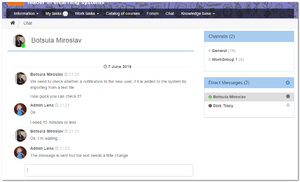 In Collaborator version 1.21 we present new function – Chat as an alternative to Forum. Now you can create group or personal communication channels. Chat uses two types of communication “Channels” for group communication and “Direct messages” – for personal correspondence. When you create a chat Channel to choose its members. The members list can be edited at any time. Access to Channel appears for each member in the Chat page where they can join to conversation. Personal communication channels are created in a similar way – only enough to find someone with whom you want to communicate. After you create a channel your colleague will have to accept your invitation. In the “Direct messages” list will be available the user whom you invited to chat. All correspondence chatting persists even after removal of the channels. So if for some reason you accidentally delete a personal channel, and then restore it again – all correspondence will be restored. Chat, like everything in the Collaborator, works with all devices – desktop computer, tablet PC or a mobile phone. You can discuss questions regardless of your location and time of day. Training Course, just like any task in the Collaborator, may be finished successful or failed. This specifies the option to set a “Threshold passing” for task. In Collaborator version 1.21 you can create custom finish pages for courses. There are two – one is shown when the user successfully completes the course, the other when it fails. They edited a built-in WYSIWYG editor. This means that you can use templates, animation effects, videos and more HTML elements. All reports in Collaborator able to adapt to the filters that we set when viewing. For example, with their help, we can easily get a visual representation of training for managers from city Kiev or get a visual evaluation of testing process for users with the tag “trainee”. Each report is accompanied by users activity charts and diagrams. Training manager works with tasks list where are created and assigned educational activity. Usually it does or educational portal administrator or tutor-coach who leads his own courses. Timely check up responses is important in the e-learning process . Free response type questions is often used in tests. With help such questions type user can send answers or files to teacher. Check of such answers is only performed “manually”. We have added a badge with unchecked answers number in row with the test in tasks list. Clicking on it you can quickly jump to checking the answers on the selected test, that speeds up the trainers work. Resource in Collaborator it is everything that the user reads, watches or listens. HTML page is most common variant of such a resource. At any time you can edit it online. Also the resource author can use the adaptive layout, insert images, video, interactive, and even add into page other resources. If you want to allow people who will read this resource page, to download the original document file MS Word, in settings enough to enable the “Allow downloading” option. Then will be available “Download” button on page when user will view a resource. 4. Polls. Who voted for that? Added simple and useful improvement. If poll is open type (not anonymous poll), then you can immediately viewing those who voted for one or other answers variant in polls report. We have moved access to polls results by the method of 360° into the “Reports” category. The access permission to reports by his subordinates are allowed and for these reports now. Author when working with course will be able to preview its components faster. On title-page of the course available links, which open the curriculum elements for viewing and editing, and available links to edit a Course Materials and a Course Curriculum. Sometimes you want to prevent printing the portal contents. Now it is possible enable the option “Disable printing” on the system configuration page. As a result of applying this option the button “Print” will be hidden and will locked browser’s print function. Nothing is sent to print, the key combination “Ctrl+P” not work, etc. Collaborator allows you to add users manually or with the help of data synchronization with external HR systems. Users that appear in the synchronization result, different from manually added users by special code from external system (“external ID”). With help of this code is identified by a person, and information about user automatically updated with every sync act. We added the editable field “external ID” in the user profile. And now administrators can include in the synchronization those users that have previously been added manually. This applies, for example, in such a situation. Are recruited candidates to work in the company. They are not a staff and therefore cannot be obtained from the personnel system. This interns are added to LMS manually and thus are included in the educational internships process. When one of them will be hired and appear in the list of employees, Administrator will enter it “External ID» in the profile. After that for this user will work synchronization function – when the employee parameters are changed Collaborator will write career history, automatically assign training activities, will open or close access to resources in Knowledge Base etc. This entry was posted in News and tagged #Collaborator, опросы, опросы 360, ресурсы, чат on Thursday June 2nd, 2016 by Балачук Вікторія.